This cowboy caviar dip (a.k.a. shrapnel dip!) is literally thrown together making it one of the easiest…AND tastiest snacks/appetizers ever. It’s perfect for potlucks and BBQs! It’s officially eat outside all day every day season around here. The months where BBQs and neighborhood potlucks are furiously frequent. Nearly 97% of the time when we are invited to an outdoor BBQ at a friend/neighbor/family members house and I’m asked to bring “something” – I end up with this easy dip in hand. Some call it cowboy caviar dip. I’ve always called it shrapnel dip. No matter what you call it, it’s one of my favorite, favorite things to eat…summer eating season or not. My cousin, Mark, sent me the recipe years ago (it probably looks familiar to a lot of you, since it’s been in the recipe archives for a long time!). The first time I made it all those years ago, Brian and I were so enamored with the deliciousness that we ate it for lunch three days straight, the two of us hovering over the tupperware not even bothering to scoop some onto plates. Just dipping, devouring, dipping, devouring while the kids looked on in a sort of shock-awe-disgust combination. Even on day three, after the avocados had turned brown and mushy, we were still groveling over it. If that’s not love, I don’t know what is. 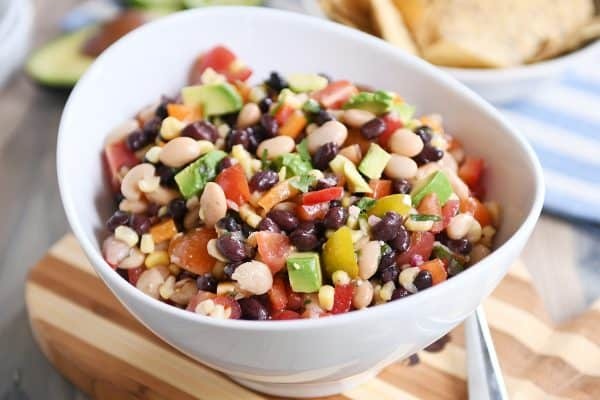 This cowboy caviar dip is a major explosion of color and taste and texture. Sweet, juicy corn with crisp red pepper and onions, hearty beans and smooth avocado, and it’s all lightly coated in a flavorful, zesty, Italian dressing. I could eat this every day of my life and be completely satisfied. It’s one of those dishes that is interesting enough to keep you from getting bored easily, but not so crazy that the flavors and varying textures become nauseating. Plus, it’s super versatile – like I mentioned above, it makes a perfect side dish or appetizer for potlucks or whatever but is hearty enough for a light meal, in my opinion. In warmer months, I often make this to serve alongside grilled chicken and this skillet zucchini squash number. Talk about a perfect meal! You can also add in cooked, chopped shrimp to the cowboy caviar dip for a totally delicious variation that makes me not want to share a single bite. If you’re looking for the perfect dish to bring to your 4th of July (or beyond) festivities, this one’ll take you less than 15 minutes to throw together, and you just might be the most popular person at the party because of it. Drain the beans and corn together in a colander. Give them a quick rinse and let them drain really well so no extra liquid makes its way into the dip. You can use a salad spinner to get rid of excess liquid or lay them out on a double layer of paper towels and blot dry. Add them to a serving bowl. Toss in the avocados, red pepper, tomatoes, red onion and cilantro. Mix. Pour the dressing over the top of the salad and using a large spoon or spatula, fold the ingredients and dressing together until everything is evenly coated. Squeeze the lime juice over the top. Gently mix. Add salt and pepper to taste. Serve immediately with chips. Store leftovers in the refrigerator. If making in advance, wait to chop and stir in the avocados until right before serving. Good quality canned corn is key here! I've found the Green Giant blend of white and yellow corn kernels are crisp and sweet and delicious. All canned corn is not created equal. Sometimes I'll also use frozen corn kernels (I spread them on a plate to thaw and then gently pat dry before using). Use an Italian dressing that you love (great flavor!). I've used everything from Annie's brand to Kraft zesty brand. I've also used this quick homemade dressing (from my fave Italian pasta salad recipe). Delicious! Blend together: 1/3 cup olive oil, 1/4 cup red wine or white balsamic vinegar, 2 tablespoons freshly grated Parmesan or Parm-reggiano cheese, 1 teaspoon honey or sugar, 1 garlic clove, minced, 1/2 teaspoon coarse, kosher salt, 1/4 teaspoon dried oregano, 1/4 teaspoon dried basil, 1/4 teaspoon dried parsley, pinch of black pepper, pinch of red pepper flakes. You can see by the ingredient list that the quantities are really adaptable based on your preferences. The key is to chop everything up in to small, bite-sized pieces so none of the ingredients overwhelm the others. Finally, if you want to take this dip to a other-worldly level, try adding cooked, chopped shrimp. Unreal. Originally posted January 2013, updated with new photos, commentary and recipe notes. I made this for a potluck last night and it was a hit! Unfortunately that meant no leftovers for me. I skipped the Italian dressing and instead used the juice of two whole limes and it was still so yummy. I’ve tried various recipes for this dip and I have to say I think I like this one the most! I left out the bell pepper and used your homemade Italian dressing as per the recipe notes. Delish! I added some chopped shrimp to my serving, as well as some crumbled feta. Definitely two excellent additions! I was skeptical about all the raves…boy was I wrong! I made this as a main dish with tortillas cheese and sour cream for a vegetarian friend and taco seasoned meat for the rest of us. I also used taco sauce instead of Italian dressing. It has been officially added to my faves. Please keep the surprises coming, Mel. So happy to hear this, Sharon! Mel, thanks for saving us at dinner time yet again. This meal was fabulous. I served it over white rice in tortilla chip bowls leftover from Cafe Rio and it was sooooooo yummy. Your website is my go-to recipe book. Thanks!!! I love reading your posts too. (I’m the one who used to work at Stonehenge with Melissa Allred). Ah, thanks so much, Melissa! Awesome! Mel, I am so glad I found out about your website. Your website is one of the best recipe websites I have found. You are a great cook!! Thank you for sharing so many great recipes. I’ve always called it redneck caviar! Yummmy! No get together in our family is complete without it. I have made this recipe at least a dozen times and my family all loves it. We sometimes do what we call “dip dinner” where we have big servings of this and guacamole and salsa with chips and no main dish. I love that I usually have all the ingredients for it on hand, too. I LOVE dinners like that. Love them. Our favorite add-in, we discovered least year, is shelled edamame! (Mukikame=soybeans) easy to find in the freezer section now & so delicious! 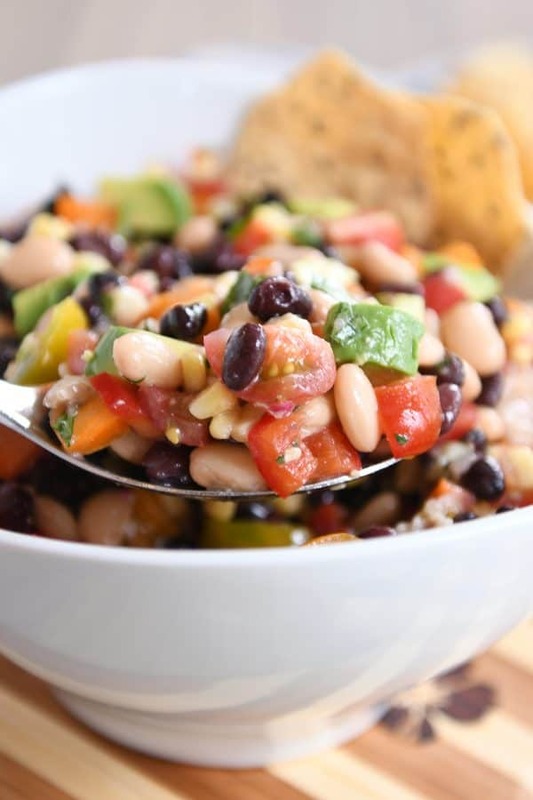 We’ve also used black-eyed peas as one of the “bean” components – so delicious! This is one of our absolute favorites! I just took it to a potluck this weekend and it was almost gone in minutes. I’ve shared the recipe many times. Love it! Glad you love it, Stacie! I have the same results every time I bring it anywhere! FYI – if you put the avacado pit in the dip (yep throw it in there and stir it around with the rest of the ingredients…just don’t try to eat it;), the avacado will stay green! This never lasts more than 3 days at our house, but the trick works for at least that long! Serious?? I’ve never heard of doing that! I just made this dip for my own housewarming party last month, and I am making it again for a housewarming party for a friend this coming weekend! I could eat this straight from a spoon (I may have done that with the leftovers). This dip is amazing! Try it with Fritos scoops. So good!! Since it is corn season, I grilled husked corn, some white and some yellow on my grill and then cut the kernels off for this dip. Much better than canned any day! At least when corn is in season. The little bit of char on the corn gave a great smoky taste! Had this dip at a baby shower. I have been making this recipe for years. I add diced jalapeno for some heat. I don’t put red bell pepper in but it sure sounds good! Since you introduced this recipe it has become a regular in our summer dinner rotation. What we like best is no cilantro, one whole lime, and 2-3T each Newman’s light Italian, Mrs. Renfro’s jalapeño salsa, and Trader Joe’s Green Dragon sauce. Today’ version was extra fancy since we had leftover grilled peppers, corn, and shrimp. I’ve made this at least six times since finding this recipe on your website about two months ago. I’ve made it for three potlucks and also for weekday lunch. Very delicious – thank you; I took your advice to use good quality canned corn. I leave out the onion and make my own Italian dressing, which takes only about another 2 minutes and is inexpensive. My recipe is similar, but it calls for rotel tomatoes (I like mild) and black eyed peas instead of white beans. I also throw in a cup of salsa in a pinch to stretch the recipe. 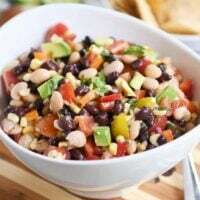 I also have made this recipe for years but called it Cowboy Caviar like others said. I would make the italian dressing from the packets and I would half the oil, and replace the other half with just water to lessen the calories. When I was doing weight watchers, I made this dip almost weekly so that I could put it on top of a salad with some chicken. I credit this stuff for helping me lose all my baby weight! Can I make the Amazing Shrapenel Dip the day before? Linda – yes, just leave the avocado out until ready to serve. Love this recipe! Making it for dinner tonight with cheese and spinach quesadillas. A great meatless meal. Love your website and recipes. Mel, your picture of the final product makes it look even better. Gotta try the chopped shrimp. I made this for the Super Bowl, and we loved it so much that I’ve made a couple more batches since then! It’s on the list of all-time favorites now. So so so good and so easy to put together. A real winner! I have served it as a side dish for any Tex-Mex meal, but never with avocados. I run, shreiking and quaking, from avocados, LOL. There’s nothing you can do to an avocado that will make me like it. I use crisp frozen corn and not canned. 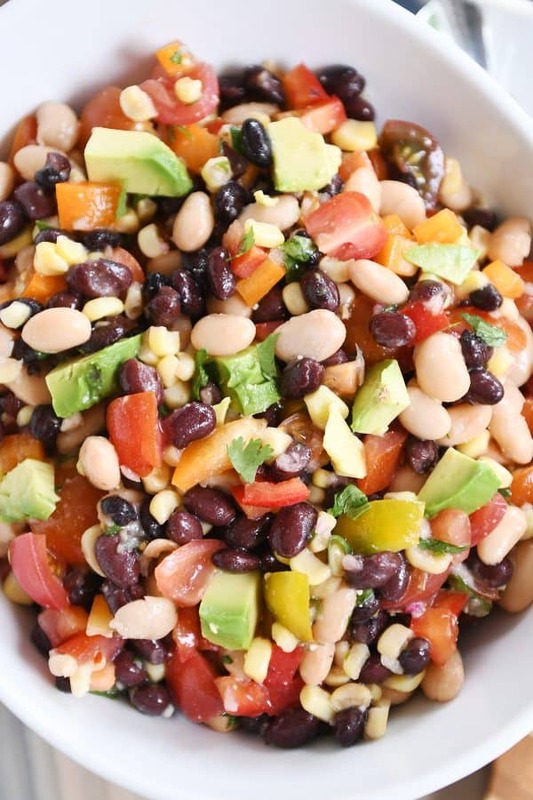 Adding garlic is good, black beans and not black-eyed peas are good, and up the lime juice. I may try adding some chipotle Tabasco in the future. It’s just way too much, volume wise, for two people to consume. I wish they sold beans in those small half-size cans rather than the tall ones. I’ve successfully frozen canned beans when I have leftovers. Just throw them in a freezer baggie and then in throw them in the freezer. Let them thaw completely and then they should be good to use. This stuff is AMAZING and addicting! The funny part–we lived across the hall from Mark (& fam) up at USU (7 years ago! wow!) and they introduced us to this famous dip! Such a small world! Thanks for formalizing the actual recipe! yum yum yum!!! We made this for lunch and my kids gobbled it up, along with me! Delicious! I used the homemade zesty italian dressing from Our Best Bites.com. It was completely awesome! Thank you! Oh I love this kind of dip! So addictive! This has been a favorite recipe for years. I use the frozen corn from Costco because I can’t stand cannned corn. Love this dish! I find it works best if you also add the tomato at the last minute (won’t get too soupy). Your favorite home-made oil and vinegar works far better than any bottled dressing. If you have any vegetarians in the house, this works great on taco night. Substitute refried beans for the meat and top with this. Heavenly. Yay! I am so glad this recipe is on here now! We always love it when Mark makes it but I can never remember everything that is in it when I want to make it myself! Now I know where to find it! i love the name, i love every single component, i love your cousin for sharing it with you, and i love you for sharing it with us–this is an outstanding recipe! I love this recipe too and found I reached “rock-star status” when I made it using homemade Italian dressing (from a packet). It makes all the difference. Yum!! My sister is famous for this recipe… she brings it to family parties and we all devour it! We also call it “cowboy caviar”. I’d say the best chips to eat this with are the Tostitos “scoops”. You can get all the ingredients in one bite, plus the juices.. and they aren’t dripping off your chip! There is not a single part of this dip that I don’t love!! Kudos to your cousin on a fantastic dip!!! WOW, not only does it look amazing, it looks as if very good for you too. Next time we have a gathering I will be making it, though will be using dry beans as I have been able to finally clean my pantry from canned food! Yes! I’ve made this before too and it is amazing. I use frozen corn like other readers have mentioned. I just made this two weeks ago when my mom was visiting. I’m the only one in my family who will eat that many fresh veggies but my mom loves it too. Looks so good. . . .I can think of many uses for this other than just a dip. It could be great on fish, chicken, pork, just to name a few. This recipe has made me famous as well. I share it all the time. I use actual small white beans that I find in a Mexican food aisle and I’ve started adding cilantro if I have it on hand. Yummy! Thanks Mark! We must be on the same wave length because I made this (with my variations) this weekend as a topping for shrimp tacos in warm corn tortillas. I coudn’t get enough of it either!!! 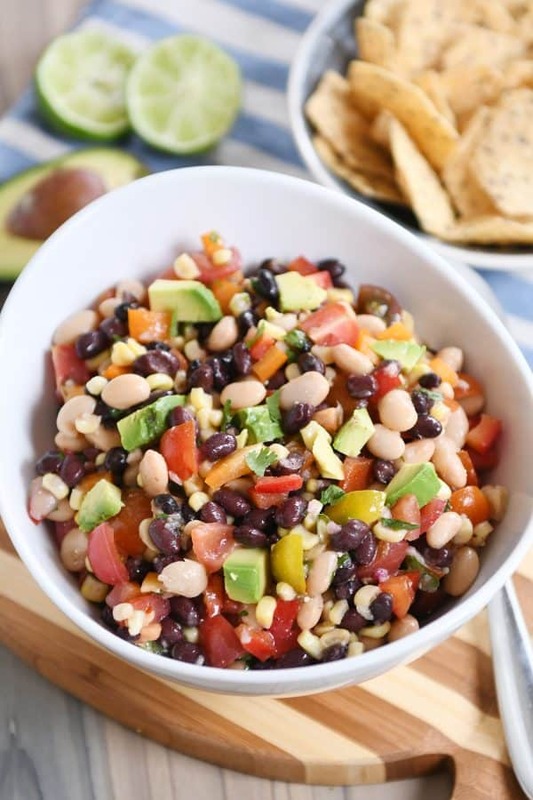 Mel–this is kind of along the same line as Pioneer Woman’s “Katie’s Roasted Corn Salad” in her first cookbook, or you can find it on other cooking blogs of people who’ve tried it, just google it if you don’t have the book. I highly recommend that! It calls for corn on the cob, which I use, so I only can make it in the summertime, but it is awesome! About following recipes…I always tell everyone that the first time they make a dish they should follow the recipe. I, on the other hand, almost never do that. I’m more likely to follow a recipe when I’m baking than when I’m cooking. This is a super good recipe. I’ve made a really similar one that has black eyed peas instead of the white beans. I also agree about your corn selection being key – I like the a white corn in it. I have almost the same recipe called confetti salsa but without corn and with black-eyed peas. And it uses a packet of the Good Season’s Italian dressing. So good! I love the idea of adding avocado and shrimp. If I have leftovers, sometimes I put it in a tortilla with some rice and make a burrito. It makes a great lunch! We make something similar to this but had a hard time finding an italian dressing that was tasty enough. We found it – its called “Hendrickson’s Original Sweet Vinegar and Olive Oil Dressing”. Any Kroger grocery store should have it (Kroger, Smith’s, Ralph’s, etc.). I highly recommend it in this dip. They sell it online at http://www.hendricksons.com as well. I’ve had a dip almost identical to this and I forgot to ask for the recipe. I can’t wait to make it….well, actually I can’t wait to eat it! I made the confetti chicken yesterday and we loved it, especially the cheesy biscuit top. 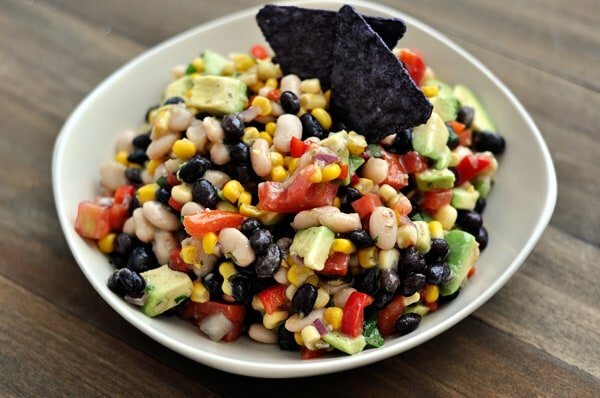 Frozen corn thawed works great in this Cowboy Caviar. And if you don’t have any Italian dressing 1 T of red wine vinegar and 2 T of olive oil makes it just as tasty, I promise! We never mess with the black beans, but sometimes we use kidney beans for the Great Northern. It’s all good! And with those hint of lime tostitos—oh, yeah!! AH! I have been looking for this dip for YEARS. I first had it when I was in high school at my ex-boyfriends house and lost the recipe over the years. I couldn’t justify calling him back up just to get this recipe, even though I *almost* did haha. You have just saved me a lot of embarrassment! we make a dip like this in our house – i love making a huge batch and eating for days in a row! This is almost my exact recipe for what we call “Texas caviar”. But of course being from Texas we use black eyed peas, which by the way, is the only way I can or will eat black eyed peas. This looks amazing. I love dips. I would rather eat them than a whole meal. I will definitely make this!!! Thanks Mel! I am on the hunt for recipes to serve at my Super Bowl party (go Ravens! ), and stopped by your site first. This dip will be perfect, Mel! I love the name of the dip, too! I’m sure thi will be a huge hit at my party!